Every morning my son complains that he doesn’t have any pants to wear. There are at least four pair in his drawer, but he refuses to wear them. One pair I’ve said is exclusively for grubby things. One pair is really nice and should be for church. (Not that he wears them for church. He picks out the second grubbiest pair for that. <rolls eyes>) The other pairs he just doesn’t like. I decided it was probably time to tackle the pile next to my sewing machine. The pile of pants without knees. Hopefully, then there would be some acceptable pants in his drawer. The first pair was a sweatpants which I simply put a square of black fleece over each knee and called it good. My daughter had a pair of black leggings that also needed attention, so I covered the hole with a black heart and stitched around it with pink. She proclaimed that they were exactly what she always wanted. Then the projects got trickier. One leg of the pants had already been patched, so I have to coordinate the patches somehow. I had done a reverse applique of a car on the first knee and it didn’t turn out as well as I hoped, so I wasn’t eager to do it again. I decided to stitch a road across the opposite knee. It’s likely these pants won’t fit next winter, so they weren’t worth too much effort. And somehow the picture is upside down. So it’s a magic car that can drive on it’s roof? 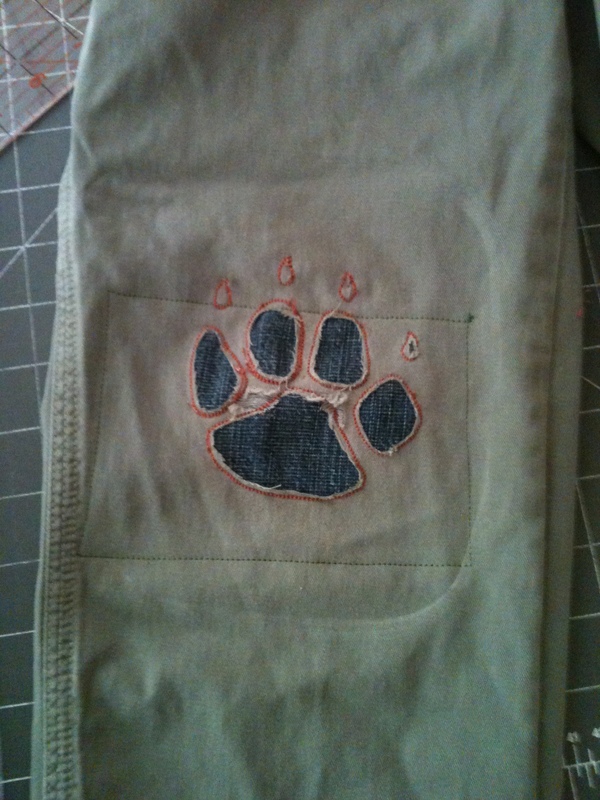 The next pair of pants I tackled and a reverse applique wolf print on the knee. I wanted to do a silhouette of a wolf on the other. Unfortunately I could not shrink the design to the needed size on my sewing machine and I didn’t feel like turning on my computer. So I went with another wolf print. It would have been a better idea to go to sleep and try it another day. 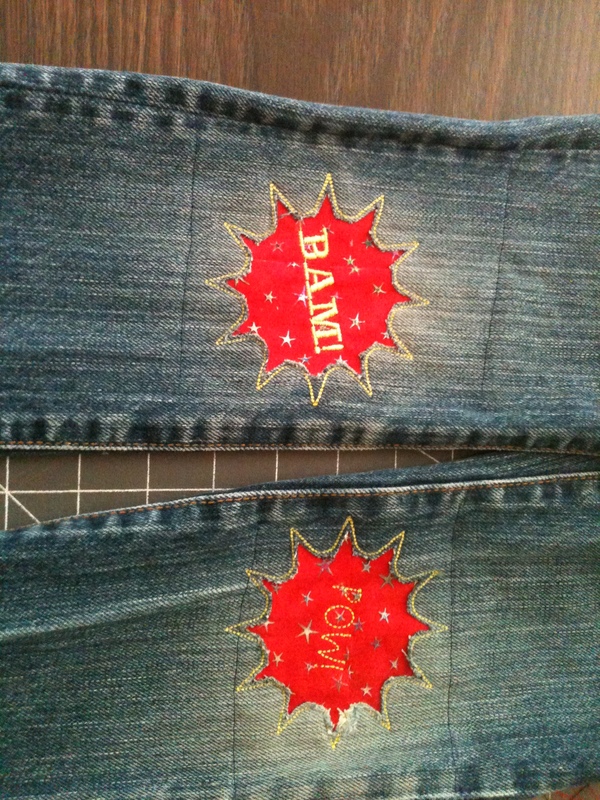 To do these patches, I open up the leg of the pants, then sew a denim piece behind the hole. 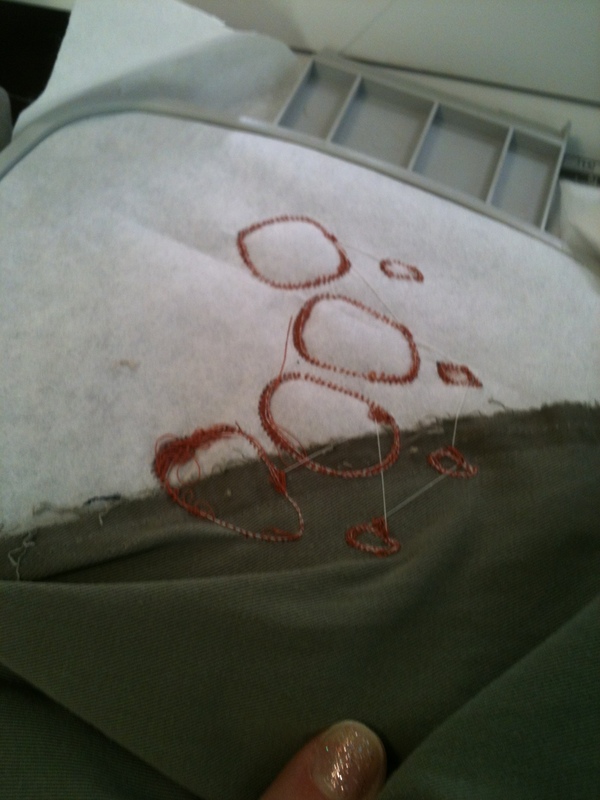 I figure out how to get the pant leg into the embroidery hoop and let the machine do it’s thing. That’s how it’s supposed to go anyway. This time I opened the leg, sewed the patch, and went for the embroidery. I promise that when I hooked the hoop into the machine I checked to make sure the other edge of the leg would not be in the way. Halfway through the design, the machine was making much more noise than when it was sewing through two layers of denim. Yes, it was sewing through three. Sigh. This is why you should open the leg seam from the pocket to the ankle. I swear I checked. I went to work with my trusty seam ripper and was able to restart the second half of the design. Some of the lines didn’t match up perfectly, but oh well. No doubt these pant wouldn’t make it next winter either. Once the embroidery was done, I had to take it out of the hoop and cut away the top fabric to reveal the bottom. This went swimmingly, although I had missed getting the hole in the pants into the center of the part to be cut away, again. Then I went to trim the fabric out of the nail prints. Strangely, I was seeing the white stabilizer paper underneath instead of the blue denim. Had I cut through both fabrics? No. I didn’t have the design aligned over the patch properly. There was no second fabric under the nail part of the design. See my above comment about going to bed instead of trying to finish the project. You can see the hole centered nicely between all the cut outs and I couldn’t cut out three of the nails because there wasn’t fabric behind them. I had one last pair to fix. I waited to tackle these until I was bright and fresh and mostly awake the next morning. Both knees were out on this pair. Remembering the lessons from last night, I made sure I opened the legs very wide and carefully positioned the embroidery design around the hole. I was very happy with how these came out. I opened the legs from knees to ankles and carefully placed the embroidery. One of the patches is a little small, but that was all the red fabric I had. The best part of this project was that my machine mostly cooperated. The problems I ran into were operator errors instead. Hopefully I can learn from those. I’m not sure these are worth fixing. It will depend on how they turn out after the laundry. He wiped spaghetti sauce all over them at supper. Who needs a napkin? There you go again demonstrating your creativity with the sewing machine. I never would’ve thought about decorating the pants. Does your son know how smart you are??? He’ll be the envy of the classroom! I figure they look less like they are worn out then. In some cases the pants look better. I love the red ones. Very batman and inner cool. The red are my favorite too. Do you do patchy butts as well? 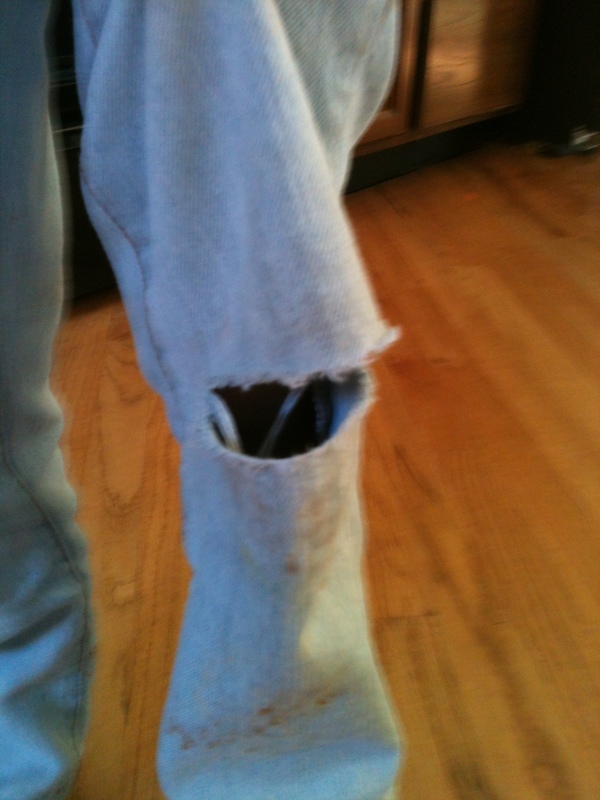 i have a pair a gym pants with maybe a half a dime sized hole up on the right cheeck near the waist. i’m thinking flowers, hearts bumble bees? Butts would be so much easier than knees. As a former elementary school principal, I’m not sure I approve of the “Bam” “Pow” knees! LOL But I admire your creativity. The car and road are really cool. You cut the leg seam apart? It must be very tough to sew that up together again. I’m impressed. Lol! I had to take the seam apart on the side that wasn’t double-stitched. Thankfully only one side usually is. OK, got it. Don’t sew much at all. LOL All I could think of was the think double seam. I like the red ones!! Very zippy! That last pair look like candidates for cut-offs. Cute patches! I had a tomboy whose jeans always needed patching. But I think I did them by hand. They weren’t as cute as these. Think the last pair would be good for cut off shorts.